United Against Racism activist Donal McKendry reports from the Jobstown Not Guilty protest held on 6 May in Jobstown. United Against Racism attended the Jobstown Not Guilty Protest in solidarity with the defendants, their families and the community. Today, the communities of Tallaght and Jobstown came together to defend their right to protest. 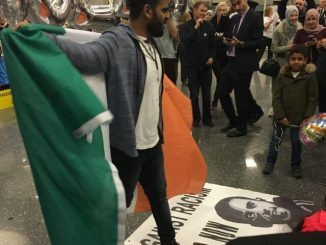 Some members of the community are facing criminal charges for simply exercising their right to protest peacefully, a fact not lost on the Halawa family, who went to Jobstown to lend their support to the local community. 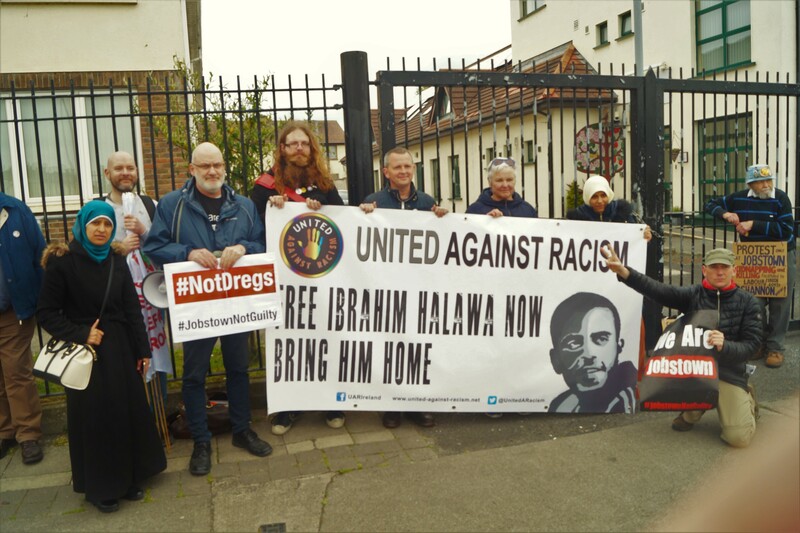 Ibrahim was born in Dublin and lived most of his life not far from Jobstown. Today, he resides in an Egyptian jail. The people of Jobstown showed great solidarity and generosity of spirit to the Halawa family in response. When one of the speakers thanked them for coming, the protester cheered in agreement. Their community has been criminalised for peacefully protesting and are facing a barrage of lies and insults including the term “dregs” being used by an official at the time about the brave people of Jobstown. They are not dregs, they are proud citizens who value their community and will stand and fight peacefully for the people of their community. Today, they expressed solidarity with Ibrahim Halawa, as they recognise that he also has been criminalised for protesting peacefully, he also has been lied about and he also is proud of where is comes from, as evidence by the Irish tricolour hanging on the wall in his Egyptian prison cell where he has been detained without trial for almost 4 years. Ireland has had a long history of peaceful protesters being criminalised. Daniel O’Connell spent 3 months in prison for organising the so-called “Monster Meetings”. The Dublin Lockout of 1913 saw sever state violence against protesters. In 1972, 14 protesters were shot dead in the Bogside as they exercised their right to peaceful assembly; they were later condemned as criminals and terrorists. In 2017 we have a former Government official sitting in court giving a very unconvincing and unreliable account of how a peaceful protest made her fear for her life. And Ibrahim, arrested at age 17 by a brutal dictatorship is left to rot in a foreign jail. His own government remains silent. The behaviour of Joan Burton in court last week indicates that the establishment in this country does not tolerate peaceful protesters. They have no intention of bringing Ibrahim home; we must support peaceful protesters through protests of our own. The people of Jobstown are not criminals, they must be acquitted immediately. 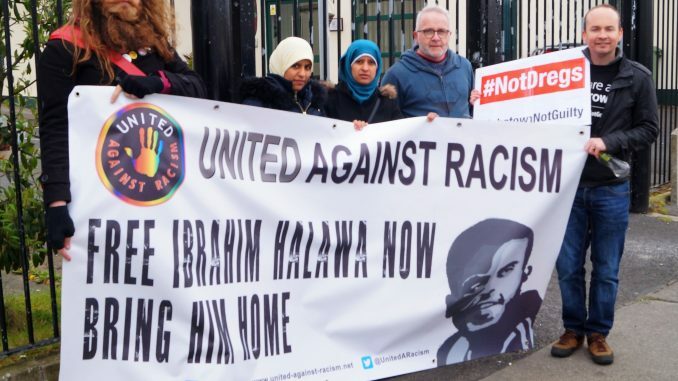 Ibrahim Halawa is not a criminal, he must be released and allowed to come home immediately.